Maybe the drum roll is a bit much, but we’re pretty excited to have seen the final touches put on our fireplaces for three of our queen guest rooms this week! 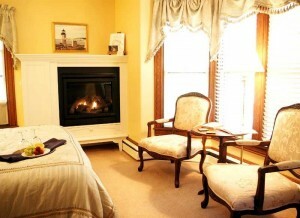 As past guests will know, none of our rooms had fireplaces when we purchased Brewster House. In the summer months that is only rarely an issue (but they still make nice, romantic, additions to the decor! ), but in the autumn, winter or spring, they are practically a necessity. We talked to different fireplace vendors and found a fireplace model that was especially thin (front to back) so it wouldn’t take up too much room in the guest rooms. 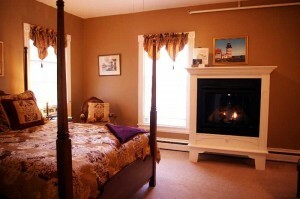 We also found that, to avoid cutting the baseboard heating supply, we would need custom mantels to house the fireplaces. We talked to a friend who is also a furniture maker, Paul Baines of Paul Baines Fine Woodworking, and we began discussing the options. One concern we had was that, with a new mantel and fireplace, the room could be crowded. Paul came up with the idea of incorporating an armoire and dresser drawer into the mantels. Due to space considerations, each of the three rooms ended up with a different configuration, but this is the basic idea we decided to use. We ordered the fireplaces and Paul took measurements, met with the fireplace vendor and got the manufacturer’s specifications. Then he went to work. Meanwhile we contacted the fire marshal to be sure everything would be done correctly, and lined up the installation of new gas lines (propane, actually) and connections to the fireplaces. Nothing ever goes entirely smoothly, and we found that the fireplaces did not come with some parts we thought were integral to their operation (a way to turn them on and off!) and appearance (non-combustible decorative material to cover the spaces between the fireplace and mantel). We forged ahead, and with Paul’s help on some of this, got the gaps filled and the remote controls installed. Paul’s workmanship is fantastic, and we can’t recommend him highly enough. 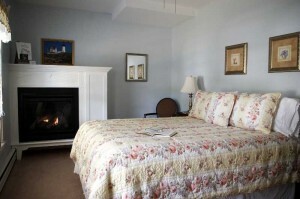 Even with the fireplaces “not quite” finished, guests have been thrilled by the addition of them to their rooms. We’ve taken some initial photos, and will probaby be posting more before long, but the photos accompanying this article give at least a glimpse of the new fireplaces. By the way, as you’ll notice from some of the photos, we’ve also completed naming the rooms after Maine lighthouses, so there are canvases of photos of the appropriate lighthouse in each room – over the fireplace, when possible. They turned out beautiful. How creative. Now you have another amenity…automatic clothes warmers.